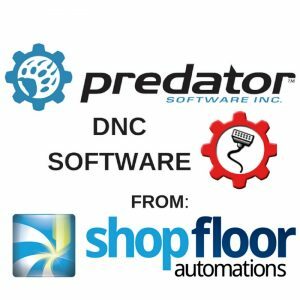 Shop Floor Automations (SFA), one of the largest independent CNC automation suppliers for Predator Software has begun implementing the latest version of Predator DNC Software v10. The new version continues to improve support for the latest CNCs, robots, PLCs and other manufacturing equipment under the latest version of Microsoft Windows. Numerous new features and improvements have been added. The support for MicrosoftWindows 8, and Server 2012 has been completed under 32 and 64 bit operation systems while including Predator DNC Objects for Microsoft SQL for 2012 and 2014. The new version extends the support for virtual operating systems such as VMware and HyperV. Predator DNC v10 supports the latest Fanuc Focas v3.9 device drivers. The change improved support for Fanuc controls with new options to eliminate spaces in filenames, automatically rename to an O number and force uppercase files. The new drivers enable support forWindows functional account providing specific permissions to access target folders to help secure CNCs from network. Additional diagnostic tools have been created to allow users to support a machine specific error log without enabling multiple commands and individual logs. A single log created to trace all activity and shared to multiple users for confirmation of transfers and historical archiving. Shop Floor Automations reports the benefits of upgrading the Predator Software to the latest version allow for future compatibility between enhanced wireless and wired serial devices used for CNC communication and machine monitoring applications. The Predator Editor Lock provides software control over a CNC machines “Write Protect” key to lock and unlock the CNC’s memory.